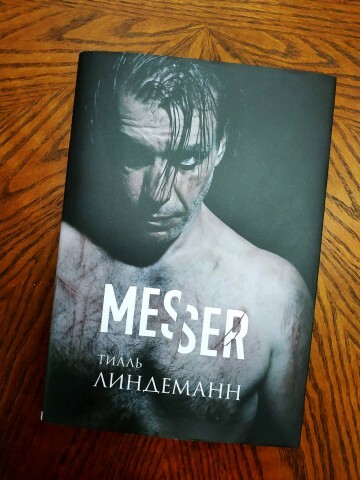 On November 30, leader of the German band Rammstein, Till Lindemann, presented a reprinted collection of his poetry "Messer" ("The Knife") in Kyiv, Ukraine. A meeting with fans and an autograph session was held in the Metropolitan Contemporary Art Gallery "TSEKH". 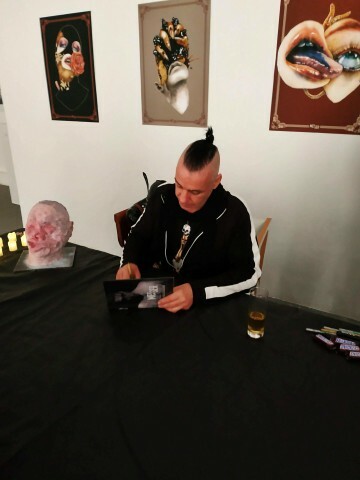 The event started at 17:00 and lasted three hours; during this time, Lindemann, surrounded by a tight circle of guards, signed hundreds of books and even took several selfies with some lucky fans. Below is our account of what happened on that evening. 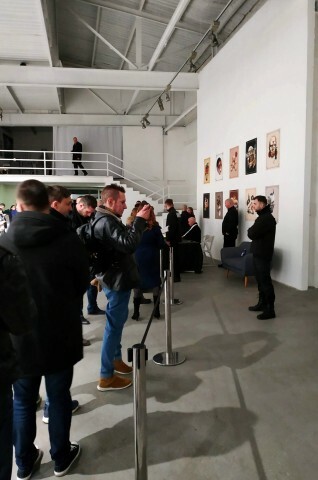 By 5:00 pm, people wishing to get an autograph of Till Lindemann began to gather at the entrance to the gallery. The peak load was between 6:00 and 7:00 pm — in the queue of 200-250 people, one had to wait about 30 minutes to get finally in. It’s interesting that this line featured not only Ukrainians but also Russians and even Turks who flew to Kyiv specifically to meet with the musician. Unfortunately, the guests were awaited by a very unpleasant surprise — they apparently missed information about the need to buy a ticket in advance, and seemed like the organizers decided it would be inappropriate to sell tickets and books at the entrance to the gallery, so the visitors, being lost for words, heard nothing more than "Sorry guys!". 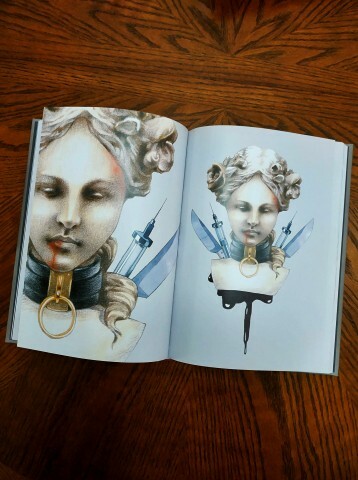 The autograph session ticket included the opportunity to visit the gallery and get a new illustrated edition of "Messer", the first version of which was released back in 2003. For 30–40 meters before the entrance door, the guests of the event went through a search of their bags, and at the entrance to the building — ticket control and checking with a metal detector, immediately beyond the threshold — scanning tickets and handing out a book from assistants. After that, the visitors lined up in a thick column to the Lindemann table, on both sides of which there were also strong guys all dressed in black. 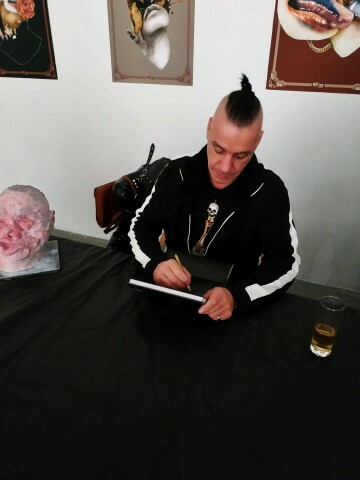 One could take photos of Rammstein’s leader only from the queue, selfies, photos with a flash, and video recording were strictly prohibited. A few meters before the musician, the guard asked the guests to open books and after that gave them to the singer for signature. It was announced in advance that the hero of the occasion signs only books — no photos, CDs, posters, and other things were allowed. By 7:00 pm, judging by the appearance, Lindemann was already tired. 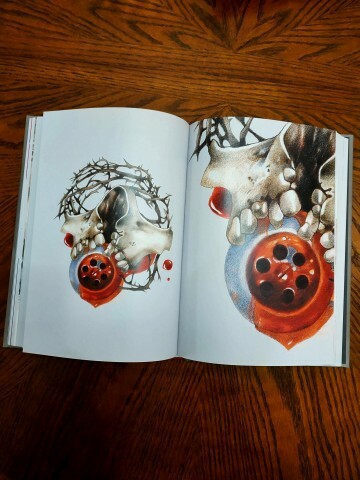 He met each coming to him person only with a glance and a quiet "Hello", after which he quickly signed the book with his unusual autograph, using a gold marker, and pulled the book back. It was possible to shake hands with the musician only on a visitor’s own initiative, on which Till didn’t refuse to respond. Thus, the meeting with the artist lasted only a few seconds, after that the guests were hurried to the exit and were forbidden to photograph anything. So how does "Messer" look? 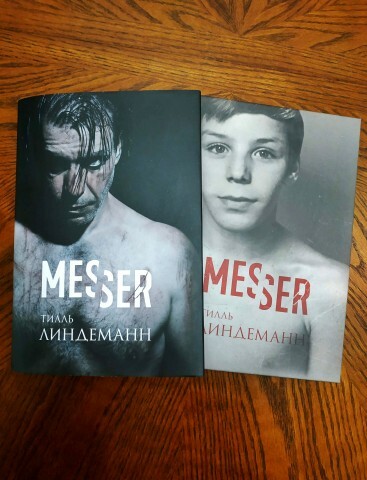 For those, who have ever held one of the first copies of Lindemann’s book, they’ll be pleasantly surprised by how ‘Messer’ has changed. The first thing that catches your eye is an additional cover with a spectacular photo of the musician — under it lies the main with a picture of Lindemann in his teen years. 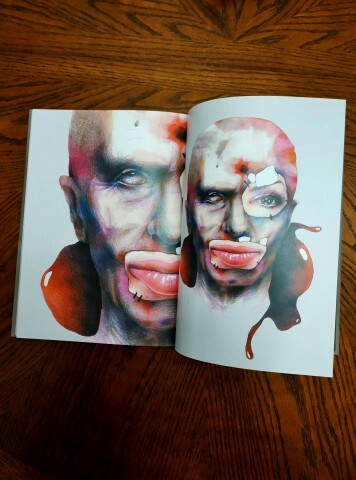 It’s a dense solid book consisting of 192 glossy pages with collected poetry in the original German language and its translation into Russian. Abstractionism and psychedelic works by the extravagant Russian artist Den Zozulya added special features to the reissued collection. 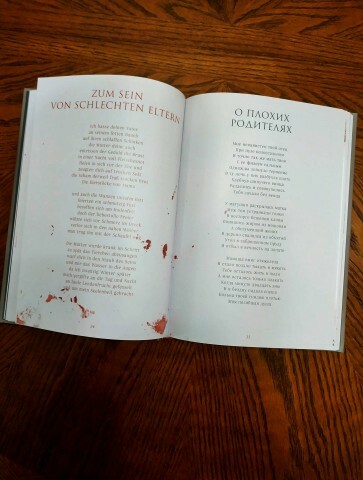 The book includes more than 50 poems by Lindemann: "Mozart Hilft", "Tod Nach Noten", "Nebel", "Notlüge", "Fausthaus", "Fütter Mich", as well as many others. As Rammstein’s artistic director and light designer Gert Hof, noted in his preface to the book, they were all written by the musician between 1995 and 2002. Of the many of his works, only the best ones were included into his collection, the rest of them were planned to be published later. 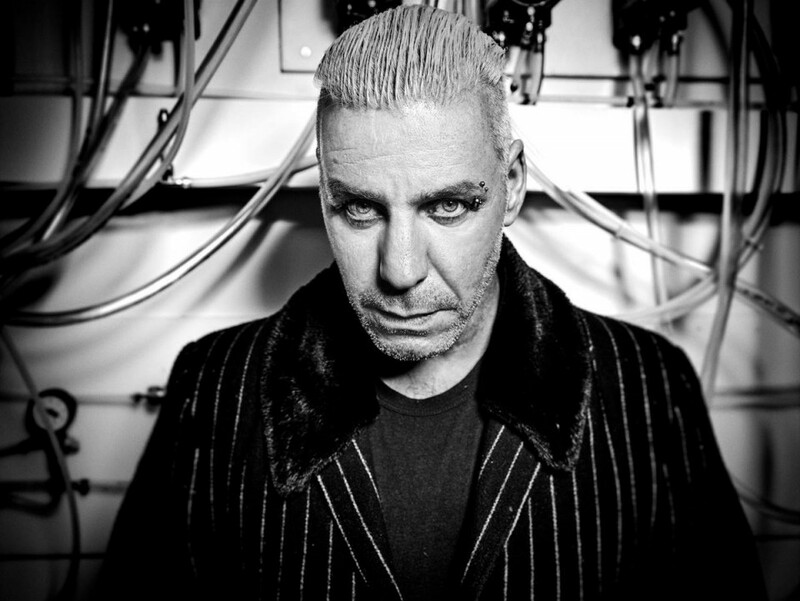 Already on December 1, as part of the international Messer Tour, Till Lindemann performed the album "Skills in Pills" of his self-named solo project at the one of the Kyiv’s clubs. For the sake of the musical part of the program, the Swedish multi-instrumentalist Peter Tägtgren, Till's partner in crime, arrived in Kyiv. Tickets for this event were sold-out in just a few days after the beginning of sales. Till will continue with a similar program, where he will travel to Russia and Kazakhstan. Translated by Dan Thaumitan and Anastezia G.